The pension fund statement regularly turns up in Swiss mailboxes. Some will file it away without a second thought because terms such as "extra-mandatory insurance," "conversion rates," and "disability pension" are more frightening than fascinating. The most important information on the pension fund statement concerns the projected retirement benefits that you will receive from the second pillar. You can only assess whether there are gaps or opportunities for optimization if you fully understand your pension certificate. This allows you to make targeted adjustments at an early stage and to optimize your pension situation in the second pillar as well as using the third pillar if necessary. In other words: You will discover errors only if you understand the document properly. Is all the information correct? The date of birth and civil status are particularly important. Reported gross/AHV annual salary: This amount should match your actual annual salary. If it doesn't, it may be that the thirteenth month's salary or bonuses were not included. Check the pension fund regulations to see if this is the case. Pensionable annual salary: This is the reported annual salary minus the coordination deduction, which is currently CHF 24,885. This is deducted because it is insured in the first pillar. The upper limit of the pensionable annual salary is CHF 85,320 according to the statutory BVG insurance. This means that the maximum pensionable salary is therefore CHF 60,435. However, many pension funds also insure salaries over CHF 85,320 or under CHF 24,885. In both cases, such benefits are referred to as extra-mandatory benefits. Level of employment: Indicates at what level of employment the insured person works. Retirement assets or retirement savings capital as of January 1: This amount consists of the contributions that you have saved together with your employer's contributions minus any withdrawals such as for residential property or as the result of divorce. Any purchases of pension benefits and the interest are also included. Of which BVG: For pension funds that offer extra-mandatory benefits, you will see two amounts listed: the overall retirement assets and the BVG component (see information on pensionable annual salary above). The latter is a part of the overall retirement assets. The pension fund has to guarantee the legally prescribed interest and conversion rates for the BVG components only. BVG interest rate: This is the legally defined interest rate. It is generally applied to your retirement assets for the last year. Currently, the rate is 1%. Interest rate on extra-mandatory component: The interest rate for the extra-mandatory insured capital is determined by the pension fund. It can be lower than the BVG interest rate. Annual retirement credit: These are the savings contributions from you and your employer that are credited directly to your retirement assets. Projected retirement capital without interest: This figure corresponds to the retirement capital that it is expected you will have saved up when you retire – provided you work at the same salary until then. Projected retirement capital including interest: This amount corresponds to your retirement capital when you retire. However, it's only an assumption based on the interest rate that the pension fund expects. It's important to know that some pension funds may be optimistic in their interest assumptions. Projected annual retirement pension from age 65 (without and including interest): This is the annual pension that is calculated based on the projected accrued capital – both without and including interest. It is based on the conversion rates that are applicable today.. Most pension funds do not present the two conversion rates separately (6.8% for the BVG component and a lower rate for the extra-mandatory component). Instead, they use a combined conversion rate. It's important to know: Many pension funds still use conversion rates of around 6%, which is considered to be too high by most specialists. This figure has already fallen significantly in recent years. In the event that you retire early, most pension funds list your projected retirement capital and your projected pension here in detail. In most pension funds, early retirement is possible from age 58 onward. The list shows the financial ramifications, staggered according to age. Annual partner's pension: If the insured dies following an illness, this amount is paid annually to the surviving dependents. If the death is due to an accident, responsibility for payments lies with your accident insurer. Payments are made to spouses, registered partners, and your own children – up to 18 years of age, or up to 25 if they are still in an education. Some pension funds also accept cohabiting partners under certain circumstances. Additional lump-sum death benefits are also possible. You can find the conditions in the pension fund regulations. Lump sum payable at death in addition to the partner's pension: Insured benefits also often include a lump sum payable at death in addition to the partner's pension. This is paid out once in the event of death. Lump sum payable at death if no partner's pension is due: In the event that an insured is single at the time of their death, the amount listed is paid out once to the surviving dependents. The order of beneficiaries in the pension fund regulations is taken into account. Annual orphan's pension per child: Surviving children receive a maximum of this benefit yearly until the age set forth in the pension plan is reached. Annual disability pension after 24-month elimination period: This amount is available to the insured should they become totally unable to work due to a disability. Annual disabled person's child's pension per child after 24-month elimination period: This amount is paid per child per year should the insured become totally unable to work due to a disability. 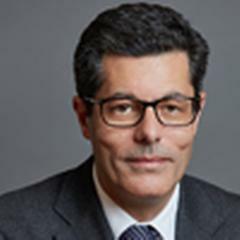 Waiver of contributions after three-month elimination period: In the event of a disability that lasts more than three months, the insured no longer has to pay contributions to the pension fund, but remains insured. Annual savings amount: This amount corresponds to the annual retirement credit. Your retirement assets grow by this amount each year. Annual contribution for risk insurance and security fund: A portion of your annual contributions is used for risk insurance and the pension fund's security, which provide benefits in the event of disability or death. Total annual contribution: The total amount comprises the annual savings amount for your retirement assets and the amount for the risk insurance and security fund. This is the amount that is paid annually to the pension fund in your name. Of which borne by the employee: Half of the total annual contribution is paid directly by your employer. You pay the other half in the form of the monthly pension fund deductions from your salary. This is the amount available to you if you leave the pension fund today. If you change employers, this amount must generally be transferred to your new pension fund. Otherwise, the amount will be transferred to a vested benefits account. This happens if you take a career break, for example. Purchase of additional contribution years: In contrast to the first pillar, you can boost your benefits in the second pillar by making voluntary contributions in order to improve your retirement benefits and, where applicable, your death and disability benefits. The amount listed here corresponds to the maximum possible purchase amount. Purchasing benefits can be useful for tax purposes. The potential tax saving depends on where you live and your individual tax situation. Purchase of early retirement benefits: This amount can be paid in so that there is no reduction in benefits if you retire early. However, this is only possible once you have purchased the maximum amount of additional contribution years. This shows the maximum amount you could receive as an advance withdrawal for an owner-occupied home. 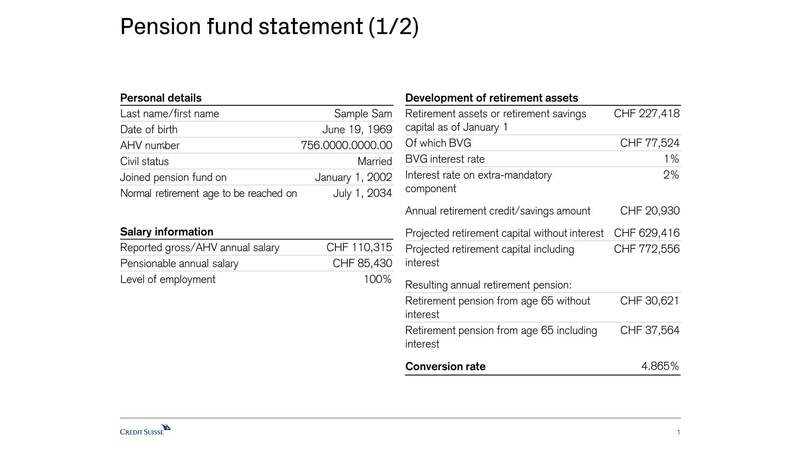 The savings in the pension fund form the second pillar of Switzerland's three-pillar system. Your financial situation after retirement consists of the benefits of all three pillars combined: Old Age and Survivors' Insurance (AHV) income under the first pillar, the BVG pension or a lump-sum payout from the second pillar, and any private savings accrued in the third pillar. Would you like to know more about your pension fund statement? Would you like to have a detailed overview of your personal pension fund situation? Would you like to know about the opportunities available to you in the third pillar to close possible gaps resulting from lower future benefits in your second pillar? Please call us at 0844 200 114 or arrange a personal consultation.